Our friends at Equity Prime Mortgage continue their creative planned giving campaign. Our hometown mortgage specialists have committed to donate $25.00 to David’s Dream & Believe Cancer Foundation for every loan closed by their Manahawkin, NJ office! We must thank the amazing staff at Equity Prime Mortgage and their clients for their personal investment in our mission and dedication to bring HOPE to our patients affected by a cancer diagnosis! Please contact our friends at Equity Prime NJ for all your Mortgage/Refi needs by calling them today at: (609) 597-0007. Have you been diagnosed with cancer? One of the last things on your mind should be making ends meet. Fortunately, there could be financial resources available for you and your family. The Social Security Administration (SSA) offers disability benefits for people in need. The primary form of disability benefits is known as Social Security Disability Insurance, or SSDI. In order to be eligible for SSDI, you have had to work throughout most of your adult life and paid a sufficient amount of taxes to SSA. So long as you’ve worked part-time for any five of the past ten years, you will almost certainly qualify for SSDI benefits. While many cancers have a good prognosis thanks to advanced technology and medical advances, your treatment may keep you from working. The SSA has strict guidelines when it comes to determining an individual as disabled. There is a medical guide, which is known as the Blue Book, they use to determine whether or not you are considered medically as disabled and meets the qualification for disability benefits. There are some cancers that meet Blue Book approval based on advancement of the cancer, while others are approved based on the diagnosis alone. Some cancers may not initially qualify with just a diagnosis, but may be approved if the cancer has “metastasized,” or spread. For example, breast cancer that has spread to the collarbone, colon cancer that has spread to the pancreas or liver, or lung cancer that has spread to the kidneys would qualify for disability benefits. The location and severity of the cancer as well as its response to treatment and your symptoms and side effects are all taken into consideration. If your cancer has returned despite a round of treatment, you will almost always medically qualify for benefits. If you do not meet the Blue Book listing for your form of cancer, you could still be approved for disability benefits. You will need to have your doctor fill out a residual functioning capacity (RFC) on your behalf. An RFC form defines your limitations clearly, so disability determination services can understand what you are able to do and what you are no longer able to do. Your physician will complete a RFC and state your limitations and how your symptoms are impacting your ability to work and handle your daily activities. You can download an RFC online. For many kinds of cancer, the SSA will need to consider your disability using a medical-vocational allowance in which a disability examiner or a disability judge decides whether a claimant is able to participate in work activity at a sufficient amount to earn substantial and gainful income. This is a process in which any past work activities and experience in addition to any other kinds of work that the SSA believes you may be able to do are considered based on your limitations and functional capacities. In addition to the limitations brought on by your cancer and your cancer treatment, any long-term physical side effects brought on by the treatments, such as cognitive and memory disorders and slowed thought processes will also be given consideration. Your age, education level, and work skills are also considered when determining whether or not you are disabled and eligible for benefits. You need to supply the SSA with all of your medical records, physician notes, documentation of your symptoms and how they affect you, test results, and any surgical notes. You do not need to physically give the SSA these forms, as the SSA will gather your hospital records on your behalf. All you will need to do is list all the doctors you’ve worked with and hospitals where you’ve been treated. Before applying for disability benefits, it is wise to speak with your oncologist. Your oncologist will be able to offer advice as to how you can qualify for benefits. He or she can fill out additional paperwork or statements on how your upcoming cancer treatments prevent you from working to assist your claim. When you have doctors working with you, your chances of approval can be greatly improved. In the event that your cancer spreads or progresses, you should notify the SSA as soon as possible. If you are interested in applying for Social Security disability benefits, you can call the SSA toll-free at 1-800-772-1213 or visit the SSA’s website at www.SSA.gov. David Caldarella is a stage IV head and neck cancer survivor. He’s also a sort of angel-on-earth for many who know him. And a hero. A leader and visionary. A friend. A listening ear. An inspiration. Perhaps most significant to the hundreds of people he has helped, he’s the Co-Founder of David’s Dream & Believe Cancer Foundation (DDBCF), which serves families affected by a cancer diagnosis. The first sign of David’s illness occurred in March, 2010. After dining out with a friend, David reports, “We returned home with me having some difficulty swallowing. It felt as if something were stuck in the back of my throat. When I went to shave in the next day or two, I noticed a lump on the right side of my neck.” David’s first doctor’s appointment in early April was rapidly followed by another, and then a surgery to remove a tumorous growth on his right tonsil and to biopsy the lump on his neck. When his doctor confirmed that David had Squamous Cell Carcinoma, “The words seemed to hold in the air for a while, just long enough for me to watch my mom’s eyes well up with tears.” David was immediately referred to Thomas Jefferson University Hospital (TJUH) in Philadelphia, and he was scheduled for a PET scan. But first there would be treatment. The plan consisted of surgeries, radiation, and chemotherapy. David writes, “The surgeries were rough on me. I was hospitalized a few times for bronchitis and kidney stones. I never had the opportunity to heal and was forced to start radiation and chemo thirty days after my last surgery.” This was the treatment plan’s recommended timeframe to ensure the best possible results. The DDBCF received its official 501(c)(3) tax-exempt status a few days after David’s last radiation treatment. Its mission and goal: to help one or two families affected by a cancer diagnosis annually. As for what to call it, that answer came naturally. David explains, “A friend of mine suggested using the website Caringbridge to disseminate information about my current health status. It was an easy way for me to keep everyone updated without having to respond to calls, texts, and emails. I always signed my updates with, ‘Dream & Believe, David.’ The name for the Foundation originated from this, David’s customary sign-off. Making DDBCF a reality and growing it to unexpected success started with bringing David back to health. David continually mentions by name, and with much admiration and gratitude, the health practitioners who have and continue to support him. David clearly made significant connections with his treatment team despite the haze of illness and discomfort that hung over him during that time. Kelly Powers served on the Board of Directors in various roles including Secretary and Treasurer for almost four years. David has known Kelly for 25 years. For more than half of his 33-day radiation treatment plan, Kelly drove from her home in Trenton to get David in Manahawkin and take him to TJUH in Philadelphia, then took him back to Manahawkin before returning to Trenton. Kelly’s friendship and continued support for the Foundation remain a constant source of strength for David. Kim McCabe Manzella currently serves as President on the Board of Directors and is responsible for creating and managing the youth group, Generation Dream. Kristin Panzone is on her second two-year term and serves as an Event and Artistic Director. Dani Corso is in her first term and is currently serving as Secretary and Communications Director. Steven Crisalli joined the Board of Directors in January 2016. All of the Directors serve on a 100% volunteer basis. David’s girlfriend, Catherine Deely, is the Foundation’s top advocate, and can be found volunteering her time to support David and the mission year-round. Joan and Vincent Caldarella, David’s parents, are very proud of David’s caring spirit: “We are humbled to witness the work of David’s Dream. His mission truly is one of mercy and love for all the people that have walked in his tracks.” David’s sister Christine, brother-in-law, Dan, nephew, Timothy, and nieces, Isabella and Sabrina, have always provided David with support, shoulders to lean on, and smiling faces. Buoyed by the gift of cancer-free status and supported by the commitment and generosity of the Foundation’s leadership, supporters, and volunteers, David continues to pursue the mission. He has spoken to over 500 families and individuals dealing with a cancer diagnosis, and notes that while each may experience a different and unique battle, as humans, they share hope and a will to live. For DDBCF, supporting patients’ and family members’ hope and will is foremost; they strive to do so through fundraising and community outreach. One newer initiative includes the Foundation’s youth group, Generation Dream. This effort gives kids between the ages of six and 16 opportunities to raise awareness for DDBCF, create fundraising projects, and mostly, David suggests, to “generate a ripple effect of kindness for New Jersey families battling a cancer diagnosis.” The Foundation recently created a Patient Advocate Committee consisting of their patients, caregivers and Nurse Navigator Elizabeth Martinez from Southern Ocean Medical Center. Lizzie was also responsible for nominating David for the inaugural Hero of Hope Award from the Academy of Oncology Nurse & Patient Navigators which David did win in October 2015. David and Kim serve on the Southern Ocean Medical Survivorship Committee and David currently serves as a Patient Advocate on the Head & Neck Steering Committee and Patient Advocate Steering Committee for the National Cancer Institute. DDBCF has also created a student group at Southern Regional High School — where David’s nephew Timothy is a member — and the Foundation has enlisted the support of Professor Dr. Ai Zhang and her students from Stockton University. David mentions something that summarizes his and the Foundation’s story perfectly: “I read something during my battle with cancer: Kindness is the shadow of God in man. Those beautiful shadows were never more present than during my battle with cancer. That same kindness, generosity of spirit, faith, hope, and love are the core beliefs of DDBCF.” David’s story shows us that both light and shadows can precede the creation of something important. David came to his current position through twists of fate. He had a typical childhood in northern New Jersey. He attended Holy Trinity Elementary School and went on to Bergen Catholic High School. The Caldarella family eventually moved to Long Beach Island where they had enjoyed spending summer vacations. Upon graduating from college, David was a project manager in construction and environmental work in northern New Jersey for 15 years, overseeing the construction of the famous Jersey Gardens Mall in Elizabeth. The commute from southern New Jersey to northern New Jersey was tough, but it wasn’t until an accident on the N.J. Turnpike that David realized he was ready for a change. He took a job in Mount Laurel at a mortgage company owned by his sister and later became a project manager for Walters Homes overseeing a site on Route 72 in Manahawkin. In 2009, David was laid off and decided to move to Florida. He began taking classes and signed up for the Coast Guard in 2010, just making the cutoff age of 41. David had always wanted to join, feeling the need to serve a greater good. David had plans to leave within a week to meet with a Coast Guard officer in Kentucky, but one evening after returning from dinner with a friend, David noticed he had trouble swallowing. Within 48 hours, he discovered a lump on the right side of his neck. He booked a flight back home and never returned. On April 20, 2010, David heard the dreaded words “You have cancer.” On April 22, he found out it was Stage 4 head and neck cancer. David began his treatment at Southern Ocean Medical Center and then received the majority of his care under the supervision of surgeon Dr. David Cognetti, medical oncologist Dr. Rita Axelrod and a cast of hundreds at Thomas Jefferson University Hospital in Philadelphia. His medical team showed no limits in their compassion in supporting David, something that continues to this day. It was during the most difficult times when David watched the clock and was unsure “if I would make it to the next minute … literally even the next second” that he began thinking of the dream and action of creating a charity that would make his nieces and nephew proud of their uncle, something that would “pay it forward,” something they would remember long after his life would end, whether it was from the cancer or many years later. David said his initial thought was to help “maybe one or two families a year.” However, five years later, David’s Dream and Believe Cancer Foundation is assisting hundreds. New to the foundation is a Patient Advocate Committee which includes nurses, caregivers and patients themselves. “Who better to help others in the healing process than others who have gone or are going through the same thing?” says David. He credits the success of the foundation to family members; to his girlfriend, Catherine, who is a breast cancer survivor and supports David and the foundation 110 percent; and to the many friends and volunteers who donate so much time. “We have a board of directors who have served and currently serve on a 100 percent volunteer basis. It is so inspiring to be surrounded by such love and compassion and dedication,” he said. We are grateful for the partnerships forged with the local businesses in the community that share in our mission to bring Hope & Financial Assistance to families in our community affected by a cancer diagnosis. David’s Dream & Believe Cancer Foundation spotlights D Finelli Construction and the Finelli family for all their efforts & support over the past couple of years helping us achieve our mission! 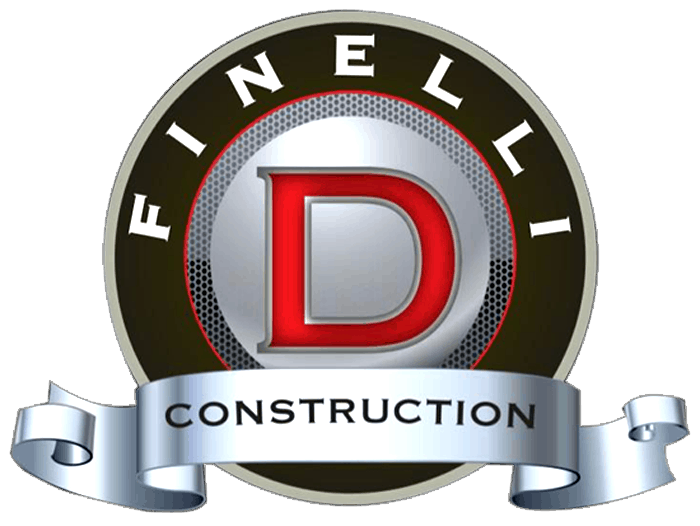 We asked Dave & Laurie Finelli to give us a few sentences of what it means to them to be involved with DDBCF. Here’s what they had to say and please support the local businesses that make it a priority and part of their own company’s mission to help the families of DDBCF. “Like so many others, we have experienced first hand the struggles and suffering that so many beautiful people have and continue to go through. We have family members currently diagnosed. We’ve lost close relatives and best friends to the disease. Our hearts get filled with sorrow. But through faith, with sorrow comes joy. The following Patient Testimonial comes from our friend Lee. This is a heartfelt and beautifully written testimonial that describes the struggle of a cancer patient as well as the eventual impact of financial and emotional support offered by David’s Dream & Believe Cancer Foundation. Thank you for sharing Lee!!! My heart is filled with joy and appreciation. This week is the first one since July 2014 during which I have not had a medical test, operation, treatment or other medical procedure. I am so grateful to have emerged on the other side of my experience with cancer as well as I have. From July of last year until this week, my life revolved around regaining my health. Some weeks I had my chemo treatment, others were filled with various tests, two operations, and most recently, I traveled three hours per day, five days a week for six weeks for my radiation treatment. It has been a long and challenging experience, as you know all too well. Based upon my experience, I would share with anyone who hears those awful words from their doctor, “It’s cancer,” a few insights. First and foremost, everyone’s experience is uniquely their own. If they were interested, I would share that I felt I was punched in the face at least once a week for 10 months. Each week was another hurdle, another challenge, another “new normal.” Also, that “punch” may come in the form of test results, an additional treatment, physical pain, emotional challenges, or financial burdens. However, though I am scarred, poorer, and forever changed, I am also wiser, more appreciative, and grateful. 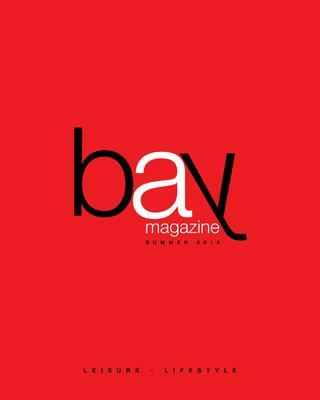 . . very, very grateful. The financial burden of cancer is one important and often overlooked part of this challenge. Though I have health insurance, the bills are awful. Unfortunately, I met my maximum out-of-pocket expense twice, once in 2014 and again in 2015. It is a lot of money. Though I could keep my head above water at the beginning, as the medical bills kept coming, it seemed like waves of water that kept coming, one after another. Though I’ve never asked for help before in my life, I realized that some relief, any relief, would help. I applied to several organizations for financial help and then waited, with fingers and toes crossed, for some help. Perhaps some organization could provide some help. Perhaps. I remember the evening that you called me. I was sitting in my room, alone, searching the Internet for any organizations that could help me financially. Maybe some organization could pay one bill? My friends and I have helped raise money for many philanthropies throughout our lives. Now I needed some help. Who would help me when I needed it? When I answered the phone and you introduced yourself, I felt a weight was lifted. You understood my experiences, you understood my concerns. You know what it’s like to tackle, and beat, cancer to then face financial debt, a lot of debt. Your generous offer to pay one of my bills filled my heart with such appreciation. That was one less obstacle I had to overcome. You made a difference, a tremendous difference. I am forever grateful that you, David and the entire team, work so hard to help me and others like me. Thank you, thank you, thank you. 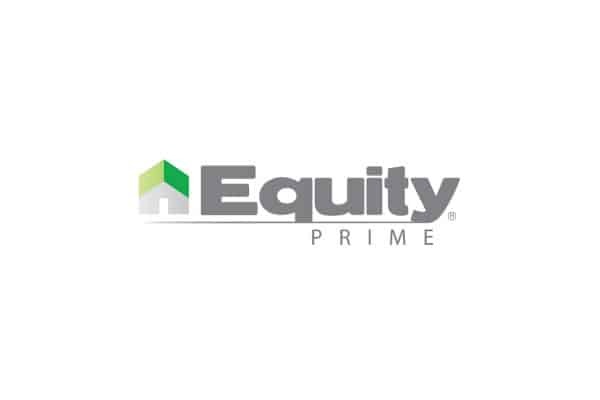 We were informed at the beginning of 2015 about a very exciting new partnership with our friends at Equity Prime Mortgage. Our hometown mortgage specialists committed to donate $25.00 to David’s Dream & Believe Cancer Foundation for every loan closed by their Manahawkin office! The totals are in for March: David’s Dream & Believe Cancer Foundation will be receiving $1,825.00 from the team at Equity Prime NJ. We must thank the amazing staff at Equity Prime Mortgage for their personal investment in the mission of the Foundation and dedication to bring HOPE to our patients affected by a cancer diagnosis! Manahawkin, NJ. March 12, 2015 – David Caldarella, founder of David’s Dream & Believe Cancer Foundation, has been elected by the U.S. Department of Health & Human Services National Cancer Institute (NCI) to serve on the Head & Neck Steering Committee (HNSC) and the Patient Advocate Steering Committee (PASC) as a Patient Advocate. The HNSC functions to harmonize an efficient, cost effective, science-driven and transparent process that will identify and promote the “Best Science” in clinical research and provide incentives to those who participate. As a Patient Advocate, David will represent the patient community and have involvement in the research development process, including concept and protocol development. David was diagnosed with Stage IV Head & Neck Cancer on April 20, 2010. He endured several surgeries, radiation, chemotherapy and a multitude of horrific side-effects during his battle with cancer. David received such tremendous support from family, friends and even strangers which fueled his desire to create a nonprofit to “Pay It Forward!” David’s Dream & Believe Cancer Foundation was recognized as a 501c3 charitable organization on August 20, 2010. 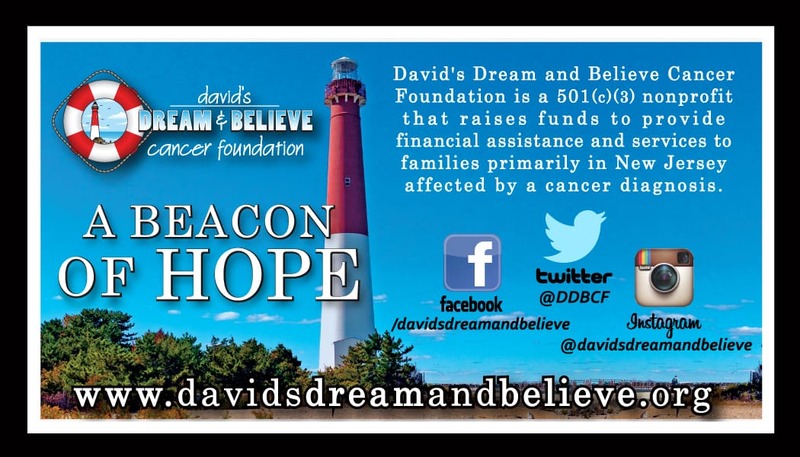 “David believes in the dream of providing Hope to those patients and families diagnosed with cancer and being the voice for those that have lost their courageous fight with cancer.” As the driving force behind the Foundation, which has donated in excess of $300,000 to cancer patients in just four years of existence, David has proudly served New Jersey families and is truly humbled and honored to have the opportunity to serve at a national level. The National Cancer Institute was established under the National Cancer Institute Act of 1937 and is the Federal Government’s principal agency for cancer research and training. NCI leads a national effort to eliminate the suffering and death due to cancer. Through basic and clinical biomedical research and training, NCI conducts and supports research that will lead to a future in which we can prevent cancer before it starts, identify cancers that do develop at the earliest stage, eliminate cancers through innovative treatment interventions, and biologically control those cancers that we cannot eliminate so they become manageable, chronic diseases. The Head & Neck Steering Committee is composed of leading cancer experts and advocates including NCI Senior Investigators and Doctors from University of Pittsburgh, University of California, University of Toronto, Yale University, Duke University, Ohio State University, Johns Hopkins University and Stanford University among many other prestigious institutions. The totals are in for February: David’s Dream & Believe Cancer Foundation will be receiving $1,125.00 from the team at Equity Prime NJ. We must thank the amazing staff at Equity Prime Mortgage for their personal investment in the mission of the Foundation and dedication to bring HOPE to our patients affected by a cancer diagnosis! A special and heartfelt thanks to our Communications Director Dani Corso and her company Volatile Media Management for creating the vision for this new partnership and making it a reality! Thank you Dani! 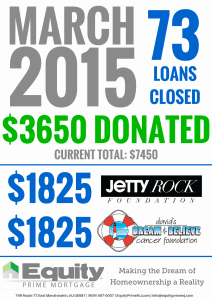 As of December 31st 2014 (4 years), we have supplied financial assistance and provided HOPE to 325 families! 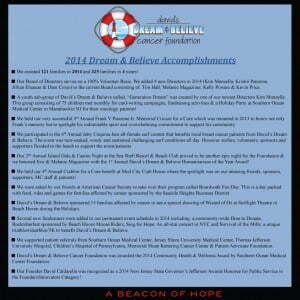 2014 proved to be a momentous year for the Foundation with a multitude of significant accomplishments as listed in the attached summary but none more important than our mission to provide financial assistance, services and HOPE to our families affected by a cancer diagnosis. All of us at David’s Dream & Believe Cancer Foundation want to thank our patients for inspiring us each and every day. We lost several inspirational members from the DDBCF patient family in 2014 but want your families to know, we carry their spirit with us every day! Thank you to the many businesses, sponsors, auction donors and volunteers! Thank you to the parents and kids from our youth group, Generation Dream. This motivated, talented and compassionate group of kids are determined to make a positive impact in the lives of our patients and their families. A special thank you to our Board of Directors (Tim Hall, Melanie Magaziner, Kelly Powers, Kevin Price, Kim Manzella, Kristin Panzone, Jillian Elsasser & Danielle Corso) who serve the mission of the Foundation on a 100% volunteer basis! 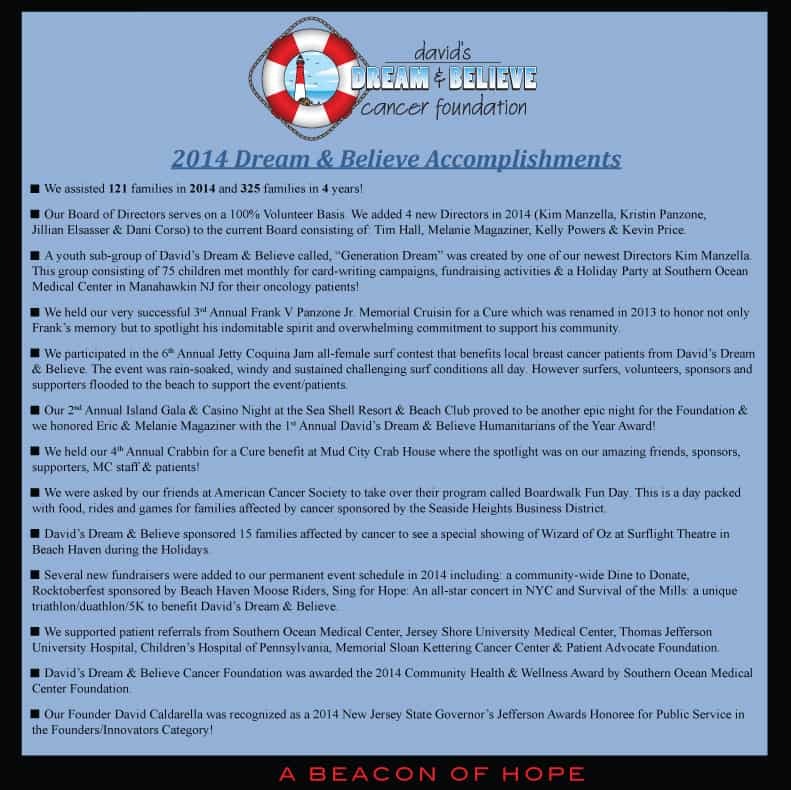 Please take a minute to look back on 2014 with us in the attached summary of accomplishments. Please know that if you attended one of our events, donated an auction item, sponsored an event, volunteered or just made a donation – YOU are responsible for providing HOPE to a family diagnosed with cancer that needs our help. THANK YOU! We HOPE that you will continue to Dream & Believe with us!